I bought this foundation a good few months ago now but I've only just started using it on a regular basis over the past month. I think the reason this foundation took a back seat is because over Summer I like to use the Rimmel Wake Me up foundation for its illuminating properties. However, now the colder weather has arrived, I don't feel like the Wake Me Up foundation is as suitable anymore. Thats when I decided I'd start using this and after giving it a proper go, I absolutely love it. Unlike the Wake Me Up which adds a very obvious 'glow' to the skin, the Match Perfection foundation adds more of a satin like finish. It isn't overly glowy but it isn't matte either - it actually reminds me of one of my favourite high end foundations, NARS Sheer Glow. The coverage is medium but its definitely buildable and I love wearing it on an everyday basis for work. It looks very natural whilst still covering any imperfections and gives my skin a nice 'lit from within' type finish. A little while ago I was sent an Omorozicza travel kit to try and although I'd never heard of the brand before, I loved the sound of the products and have since discovered its a pretty luxurious brand. Although I've enjoyed using all the products (I'll review the little set I received soon), this 'Queen of Hungary' mist has definitely been the one I've reached for most. I've been using this almost every day between cleansing and moisturising as the toning stage of my skincare routine and I've totally fallen in love with it. Not only does it smell amazing but its so refreshing on the skin and it leaves my face looking much more awake, fresh and plump. I also love that its a very fine spritz and not one that leaves my face looking wet after application. This makes it brilliant for spritzing over makeup to create a natural dewy finish. Its a pretty pricey product and not a necessity but its definitely a nice luxury if you feel like treating yourself. I bought this on a random trip to Boots a little while ago as it had a couple of quid knocked off the usual price. I was originally drawn to the range of moisture match moisturisers because of the colourful packaging (each moisturiser is a different colour) and the fact they were all designed to target different problem areas. My skin was looking a bit lacklustre and dull at the time so I decided the illuminating option would be best for me. As soon as I took one sniff of it and swatched it on the back of my hand, I was sold. I kid you not - this moisturiser has the most amazing scent I've ever come across and for that reason alone I'll definitely repurchase. Its a total joy to apply to my face each morning. I also find it sinks in exceptionally easily, gives me a bit of moisture (it isn't exceptionally moisturising so if you have dry skin I'd recommend getting the one specifically designed for dry skin) and as the product claims, it brightens and illuminates my complexion. I LOVE it. When an email landed in my inbox asking if I'd like to try some new limited edition Modelco lipsticks, I immediately said yes. Modelco have teamed up with Birchbox to create two sets of three lipsticks - the 'classics' set and the 'Naturals' set. I decided to try the Classics range as all three colours appealed to me (a peach, a red and a berry pink). 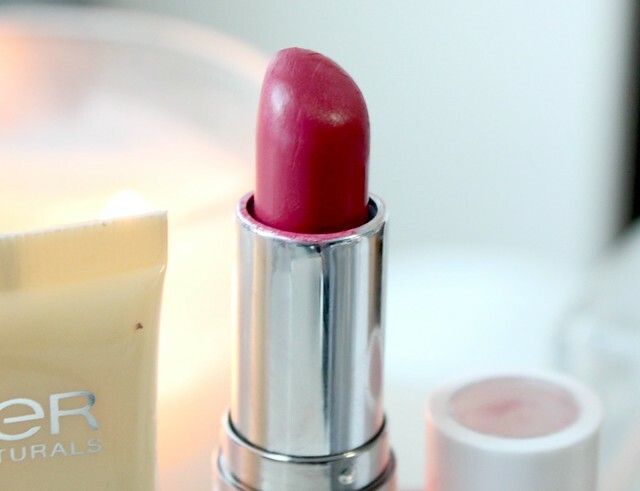 I've been using all three lipsticks since the set arrived and I love them all but 'Peony' the berry pink shade has been the stand out for me. I find its a perfect colour for every day wear as it isn't too bright and it has a beautiful moisturising formula and satin finish. Modelco claim these lipsticks are matte but they're definitely not - I've got no idea where they got that idea from. I'll do a full review of the 'classics' set including swatches soon as I think it'd be a great Christmas gift for beauty lovers. I bought this moisturiser from Boots after reading lots of rave reviews and I have to say I'm really impressed. I wasn't expecting anything amazing from a drugstore moisturiser but it hydrates my skin well and creates a lovely base for my makeup. It definitely helps smooth my skin out and reduce the appearance of pores. I've even been applying this in the morning and thinking my skin looks pretty good without makeup. That's a first for me, trust me. I won't say too much more as I'll be reviewing this in full soon. The problem with having a lot of makeup is the fact that some things you once loved can get lost amongst everything else and you forget to use it. That's what happened with this product - I loved it when I first got it and then it got forgotten about amongst my other eye products. However, its well and truly back now and I've been using it all the time. Its a great shade (it really reminds me of MAC Satin Taupe) and the high metallic finish is stunning. Its a great product to sweep on when I'm in a rush as I can pop it on with my finger and be done with it as it looks so great on its own. Its also great for popping under powder eyeshadows as a base as it really helps to intensify the colour. Overall a great all rounder and something everyone should have in their makeup stash! There's nothing I love more than getting home from work and snuggling up on the sofa with a cup of tea in hand and some candles lit to create a relaxing atmosphere. As someone who suffers with anxiety, I like to do anything I can to create a serene and calming atmosphere and for me, candles are a great way to do that. Especially if they have lovely relaxing scents too like this NEOM beauty. I was sent this just over a week ago so its fairly new to me but I've lit it every night since and have become a little bit obsessed. It has a gorgeous scent of Lavender, Jasmine & Brazilian Rosewood and I find the fragrance is gently distributed around the whole room creating a relaxing enviroment. I also love that it has three wicks (the simple things) as it looks so pretty flickering away in its glass vase. It also has 50 hours of burning time which is pretty damn impressive! So there we have it, the products that have stood out to me over the past month. Have you tried any of them? What have you been loving this month? I am such a fan of the Garnier Moisture Match cream, like you I got this discounted and was so surprised I liked it. Candles are such a winner too for relaxing, this one looks stunning! I really want a Neom candle they look lovely. 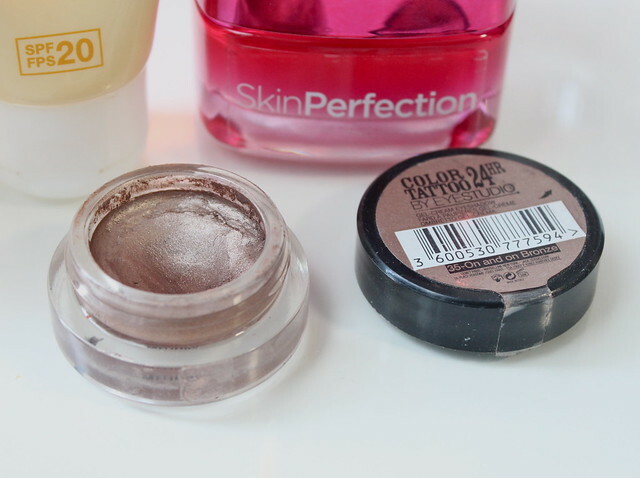 I also love the maybelline colour tattoo in on and on bronze, so good. You've picked some good favourites here. I am still not sure about match perfection after a week of use. I'll give it another chance. i loveeeee the same shade in the maybelline cololur tattoo aswel! my firm favourite by far! I've just purchased the Rimmel Match Perfection today & now i'm super excited to try it. And was supposed to be picking up that foundation on my shopping trip last week but got home and realised I'd forgotten it. Oops! Great picks! I looove candles and I have to try out the foundation from Rimmel! This candle just sounds amazing. i too suffer with anxiety and panic attacks. I love lighting my candle at night. The flame flickers really help relax me. 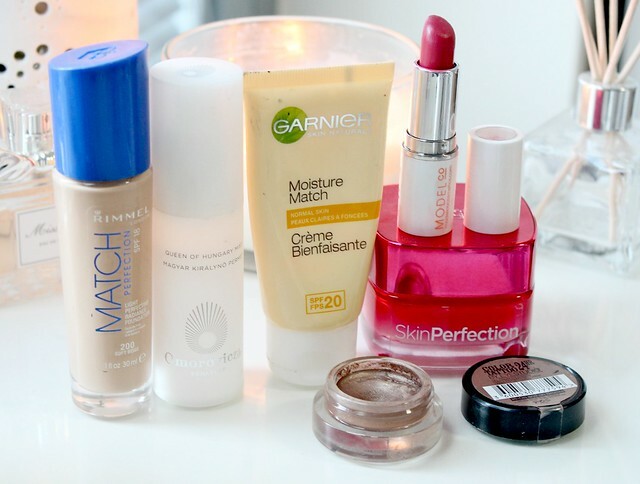 The match perfection foundation is my favourite at the moment too, amazing for the price! And the garnier moisture match moisturisers are insanely good for the money, I've tried 2 from the range and love them both. I already have 3 color tattoos but I think the bronze one is the next one I need to add to my growing collection! I am also a huge fan of candles but I have to say, I don't like spending so much money on them although the Neom ones do sound luxurious for special occasions! That candle sounds heavenly! I love scented candles but they're so expensive! Some great pics there! Have always wanted to try the Queen of Hungary Mist so looking forward to your review of the Sartre pack. Must also try the Rimmel foundation if it's like Nars Sheer Glow! This is my personal favorites too! I'm glad you've featured all of them. Keep up! My sister gave me her foundation because she thought it was too yellowish, but I really really like it. 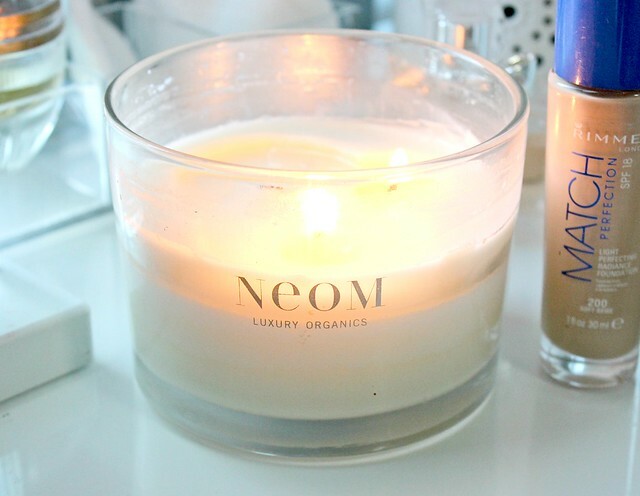 I'm dying for a Neom candle, I'm certainly going to purchase one next payday cause they smell divine! I really want to try the moisturiser! ive been loving candles lately too! Lucky you on being asked to try out the new lipsticks! I have the Garnier Moisture Match Moisturizer for oily skin and love it, such a bargain, xoxo. I'm currently using the Rimmel Match Perfection and I love it so much. Such good coverage and great colour! The Garnier Moisture Match moisturiser is also really good, I use the one for dull skin and it's worked wonders! Usually I stay away from Rimmel's foundations because they are much too dark/orange for me, but this shade range looks really good. The finish sounds amazing too. Great picks, The neom candle sounds lovely and I like the look of the skin perfection moisturiser, i've been loving the new skincare items that loreal's been bringing out lately. That neon candle sounds absolutely amazing. The Neom cream is my fave. It is to die for, I use it all the time and I would never change to a different brand. On & on bronze is such a beautiful shade and so easy to just sweep on in the mornings! I need some candles in my life! Especially now the weather has turned! I've been wanting that Color Tattoo for awhile! Oh gosh, I always just want everything on your favourites lists! I could never get the colour tattoos to work for me, they always creased like crazy! I must give them another go to see if there has been any improvement! 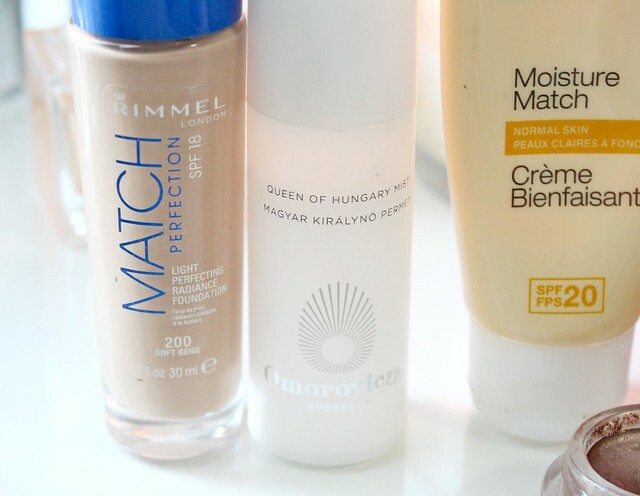 The Rimmel Match Perfection foundation is one of my favourite "drugstore" ones!